Gungahlin is an area with an expanding population, and deserves population to City express services IMO, below is a map that has a few possible Express services. As for the part of the map that is not shown, the Xpresso would continue to the City down Gungahlin Dr, left down Barry Dr, through the City Interchange, and terminate at Sydney Av as per a normal Xpresso into the suburbs, feel free to share your thoughts on this proposal. Oh, forgive me for the crappy quality too, a 15min job in Paint. Pretty good, although i would probably suggest also running at least one of those via the town centre, maybe start the 753 there? And no love for Casey, Forde, Booner (heh, a typo but i'll leave it), Harrison, Franklin, Gungahlin (the suburb) or Crace? Crace, again, an Xpresso when it comes. Franklin and Harrison already have a direct service to the City! An Xpresso wouldn't be required, perhaps making the 58 a 258 would have merit. As for the Direct Gungahlin - City services, the 5 already serves that purpose, and the 757 from the Office parks. In retrospect, maybe a 754, servicing Yerrabi, Forde then Amaroo would be appropriate. Interesting thoughts, but would 751 provide a faster service to Palmerston than 56 does currently? If so, by how much? 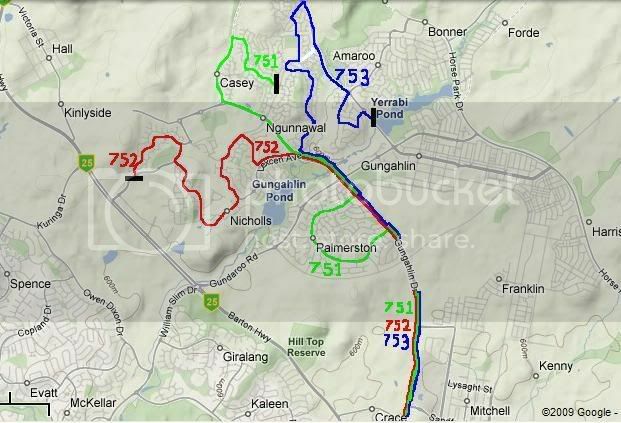 I would think that 753 should go the other way around - to Paul Coe Cres first (or last), then through the rest of Ngunnawal. Skipping Northbourne would increase travel times by approx 3-5 mins, nothing substantial, but still a difference. And the 753, I was considering that too, perhaps a 754 should be put there servicing Amaroo and Paul Coe, as at the moment, passengers travelling from the City would have to go via Gungahlin Marketplace, Forde, and finally get to Amaroo, the idea for an Xpresso for Amaroo definately wouldn't go astray I suppose. 'Increase'? then why bother - let 56 continue servicing Palmerston and re-work 751 and 753 to serve Amaroo, Forde and Casey. Oops, where was my head lol, decrease travel times. While the difference is minuscule, Palmerston does have high patronage figures (more so than other suburbs - my observations only), and deserves some sort of a direct link, but, yes, improvements could be made elsewhere in Gungahlin in lieu of Palmerston. It is unfortunate that the Xpresso concept is being removed; one service that I always believe should have existed is a service direct via Northbourne Ave & Barton Hwy to Gold Creek, Nicholls and Casey. Two colleagues in my office will not ever consider using public transport until such a service exists; they drive the direct route and will not consider travelling the long way via Gungahlin and Flemington Road.